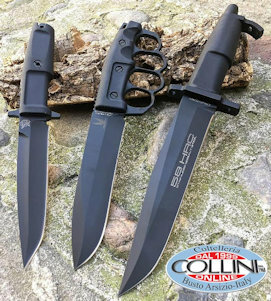 Belonging to the group SMG Inc. (Sport Manufacturing Group), the new American brand Steel Will specializes in the production of tactical and outdoor knives. The young company's goal to create a line of quality knives which are very practical and have an innovative design. To achieve this, Steel Will uses partners located in various parts of the world (including Italy) working with modern technologies and employing selected steels from all over the world (USA, Japan, Austria, China, etc. ). The brand name, Steel Will, is very engaging and bodes well for knife fans who are looking for a breath of fresh air in the knives market. The common denominator of Steel Will's products is the careful eye for design but without losing sight of what is the usability and harmony of the knife. This philosophy is fully expressed in the outdoor knife series called Druid, a name inspired by the priests of the ancient Celts. In particular, the Druid 200 is a multifunctional utility knife ideal for camping activities, hunting, hiking and outdoors in general. The blade shape, the handle and sheath are in a classic style but, at the same time, are characterized by modern details. The blade, which is slightly curved in the central part, has a drop point configuration with saber grind. It has a length of 157 mm and a thickness of 4.8 mm. The steel used is the Chinese 9Cr18MoV to 58-59 HRC, comparable in composition to the 440B but which provides better performance thanks to the presence of greater amounts of Molybdenum - which increases the hardness, strength, toughness and improves the hardenability - and a small percentage of Vanadium (0.07- 12:12%) - which contributes to reducing the size of the crystal grain and improves wear resistance (although in this case so negligible given the small quantities involved). Based on my personal experience, this type of steel is not one of those I prefer for outdoor knives; the 9Cr18MoV shows a good corrosion resistance and ease of sharpening that, although representing a characteristic appreciated on the field, this steel has a limited edge retention. The Druid 200 is a full tang knife, with handle made by injection moulding of a thermoplastic elastomer (TPE); the tang is exposed in the terminal part in order to be employed like a hammer. The handle has a network-like pattern, which characterizes the whole Druid series, and the choice of the material used guarantees a secure grip of the knife, even in wet conditions. The sheath is made entirely of good quality leather, with resistant seams with welded terminals to ensure greater durability. The knife retention is simply given by the friction of the rubber-like handle on the inner part of the leather sheath that goes literally to embrace the knife handle for about 3.5 cm. Despite being an elegant solution, from the practical point of view it involves the use of two hands to avoid damage to the sheath itself: it is in fact necessary to grip the sheath in the upper part to enlarge the flaps and place the blade inside. Clearly this operation will be facilitated with the passage of time, once the skin will have taken the shape of the knife. It should, however, be noted that after a certain number of knife extractions, the leather in contact with the rubber-like handle will inevitably tend to be consumed. The sheath can be carried on the belt, thanks to the leather loop attached via a steel D ring. For outdoor life, both for ease of maintenance and cleaning, and also for the carrying system and practicality of use, as well as for greater resistance, I personally prefer the more versatile kydex sheaths (or better yet, the combined kydex-cordura sheaths), but for leather lovers this sheath will be much appreciated for its good quality. Finally, one cannot fail to mention the choice of packaging of Steel Will's products, nicely taken care of for details and differentiation according to the category (outdoor, tactical, urban). The Druid 200 price in Europe is around EUR 110,00 (European distributor SOLDIER of FORTUNE), while in the US the price on the official Steel Will website it is around 110 $. The Druid 200 was tested during a day in the woods, and has been used for our usual qualitative cutting and resistance tests. The sharpening of the product (tested on ropes of various diameters and on different woods such as pine, acacia and hazel - both fresh and seasoned - watch the video below ) proved to be of good quality and the edge retention has exceeded our expectations in relation to steel used (at the end of the test the knife needed to be sharpened). Also the batoning and chopping tests were overcome brilliantly, as well as the penetration and resistance tests of the tip. Overall, the Druid 200 proved to be a product that gives much satisfaction and, with its sleek lines, makes it and attractive knife from the very first look.